216 pages | 442 Color Illus. The book uses a symptom-based approach to assist the clinician in the diagnosis and management of those conditions that fall into the speciality of oral medicine. Dealing first with normal anatomy, physical examination and investigation—particularly lesional biopsy, hematological assessment and microbiological sampling—the authors cover all areas of those diseases, local and systemic, that manifest themselves in the lips and mouth. Conditions are grouped under their principal presenting sign—blistering, white patches, red patches, swelling, pigmentation, pain, dry mouth, altered taste, and halitosis. This comprehensive handbook is of value to professionals and trainees in medicine, dentistry and pathology. …perfect to keep in surgery for professionals and an equally valuable educational book for the student…excellent pictures of normal structures…ample information on special investigations…extremely user friendly…extremely well written…contains a remarkable 425 high quality colour photographs…clinical cases …will be of particular use to the dental student…an excellent book, which covers the subject exceptionally well. 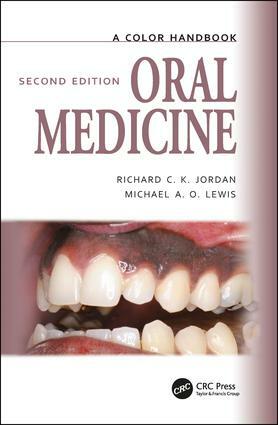 Its concise nature and well planned structure make it one of the most accessible books in its field…a must have book for any dental or medical professional. A well written, well presented text…of interest, and clinical relevance to dental practitioners. A genuinely practical source of reference…lavishly illustrated…will appeal to dental undergraduates who are sure to find its well-planned layout and wealth of colour images of real value in their studies.